North Ridgeville officers participate in Operation Open Heart, which consists of a group of Law Enforcement Officers from various Lorain County Law Enforcement agencies. Operation Open Heart is a program founded in 1962 to help the less fortunate children in Lorain County. The officers spend a week with a group of children who are orphans or foster children who are currently under the control of Lorain County Children Services. The children are males between the ages of six and seventeen. The idea behind the program is to be a positive influence in the lives of the children, and to provide them with goals and direction. The officers take the children to various locations throughout Lorain County where they participate in varied activities. These activities may include airplane rides at the Lorain County Airport or boating on Lake Erie. Visit the Operation Open Heart website for more information. 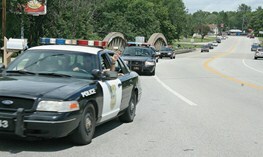 Lt. Lee, shown here leading a procession of police cars during 2008 Operation Open Heart, has been a member of the program since 1997. 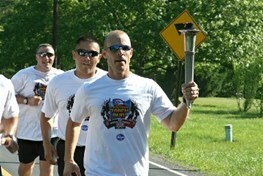 In 2007, officers of the North Ridgeville Police Department initiated and participated in the Lorain County leg of the Law Enforcement Torch Run for Special Olympics, and have continued the tradition annually.The Torch Run is designed to raise awareness and donations for the Special Olympics. In addition to officers from North Ridgeville, officers from the Avon Police Department, the United States Coast Guard, and the Elyria post of the Ohio State Highway Patrol also participated. Since 2007, this event has grown to include officers from numerous local law enforcement agencies, as well as students from the Lorain County Community College Police Academy. To date, over $9,000.00 has been raised for Special Olympics. A large percentage of these donations have come from the citizens and businesses of North Ridgeville. The Torch Run began in 1981, when Wichita, Kansas Police Chief Richard LaMunyon saw a need to raise funds for, and awareness of, Kansas Special Olympics. He felt that Special Olympics was a fitting cause to unite local law enforcement officers, giving them closer ties to the community and to a very special population. After three successful years, Chief LaMunyon presented his highly successful Torch Run program to the International Chiefs of Police (IACP). With the support and endorsement of the IACP, the idea was launched nationally, and today involves law enforcement officers from all fifty states and over 25 countries around the world. What began as a local fundraiser has become the largest fundraising program in the world to benefit the Special Olympics. Special Olympics Ohio is a not for profit organization that provides year round sports training and competition in a variety of sports to over 20,000 adults and children with developmental disabilities. Special Olympics provides them with continuing opportunities to develop physical fitness and demonstrate their courage. For more information visit the Ohio Special Olympics website.